The JCR 2.0 API specified by JSR 283 has been in Proposed Final Draft (PFD) stage since March, and Apache Jackrabbit developers have been busy implementing all the specified new features and adding compliance test cases for them. Both the Reference Implementation (RI) and the Technology Compatibility Kit (TCK) of JSR 283 will be based on Jackrabbit code, and we expect the final version of the specification to be released shortly after Jackrabbit trunk becomes feature-complete and the API coverage of the TCK reaches 100%. The following two graphs illustrate our progress on both these fronts. First a track of all the JCR 2.0 implementation tasks we've filed under the JCR-1104 collection issue. The amount of work per each sub-task is not uniform, so this graph only shows the general trend and does not suggest any specific completion date. 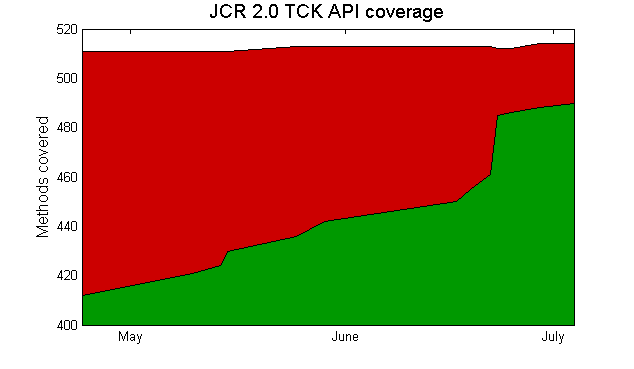 The second graph tracks the TCK API coverage. We started with the JCR 1.0 TCK, so the first 300-400 method signatures were already covered with few changes to existing test code. 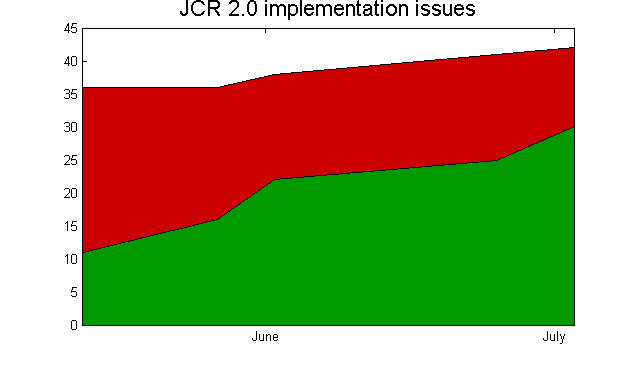 Based on Julian's API coverage reports in JSR-2085, this graph tracks progress in covering the 100+ new method signatures introduced in JCR 2.0. Again, the graph is meant to show just a general trend and should not be used to extrapolate future progress. Wan't to see JCR 2.0 in action? The latest Jackrabbit 2.0 alpha releases are available for download!